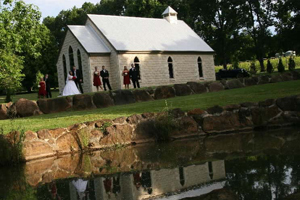 Many natural attractions greet the Tamborine Mountain visitor. A number of breathtakingly beautiful waterfalls are located all over the mountain and are often the reason why so many visitors return time and again. After prolonged periods of rain, waterfalls are at their most spectacular, but all flow year round. 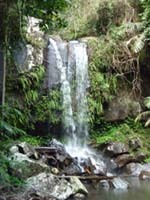 A bit of walking is always involved when visiting one of the many waterfalls on Tamborine Mountain. It is hard to pick any particular waterfall as being “the best” – all of the waterfalls have their own special beauty, and need to be seen to be appreciated! A short stroll from the car park at the end of “Cedar Creek Road” provides access to Cedar Creek and some of its spectacular cascades, waterfalls and rock pools. Visitors pass a couple of rewarding lookouts, and descend down into the open canyon via a sealed pathway. As Tamborine Mountain is not connected to town water, these are the only swimming holes on the mountain. Please observe all regulatory notices. For information on how to get to “Cedar Creek Falls” please CLICK HERE. The top of the falls is reached after a very enjoyable 30 minute walk starting at the “Knoll Road” lookout. A secure concrete bridge crosses “Sandy Creek”, a viewing platform a few meters to the west offers great views inland as well as on to “Cameron Falls” to the east. For information on how to get to “Cameron Falls” please CLICK HERE. 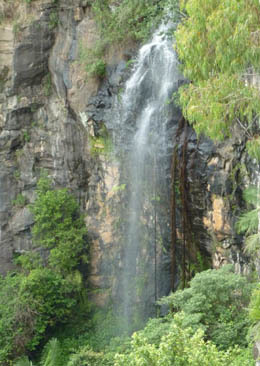 Being located within Queensland’s first National Park, “Witches Falls” is one of the most popular waterfalls. Access is via the “Main Western Road” car parking area opposite “Hartley Road”. Being located on the “Witches Chase” hiking track, the falls are best admired from the viewing platform also offering great inland views. 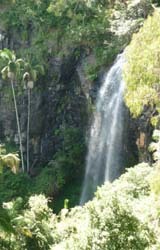 For information on how to get to “Witches Falls” please CLICK HERE. 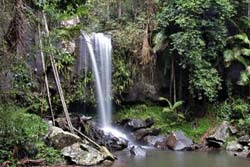 Located in the heart of Tamborine Mountain, “Curtis Falls” is the only waterfall that can be viewed from the bottom of the falls. Being fed by “Cedar Creek”, a permanent creek, the falls run all year-round. The walking track ends at a viewing platform overlooking a large rock pool, with great views of the falls and the surrounding columnar basalt rock face. This entry was posted in Tamborine National Park and tagged attraction, beautiful, bush walks, mount, mountain, Tamborine, waterfall, waterfalls on January 1, 2013 by admin. In North Tamborine, turn off “main Western Road” into Main Street, continue past the shops and the residential area where it becomes “Knoll Road”, keep left when the road forks. 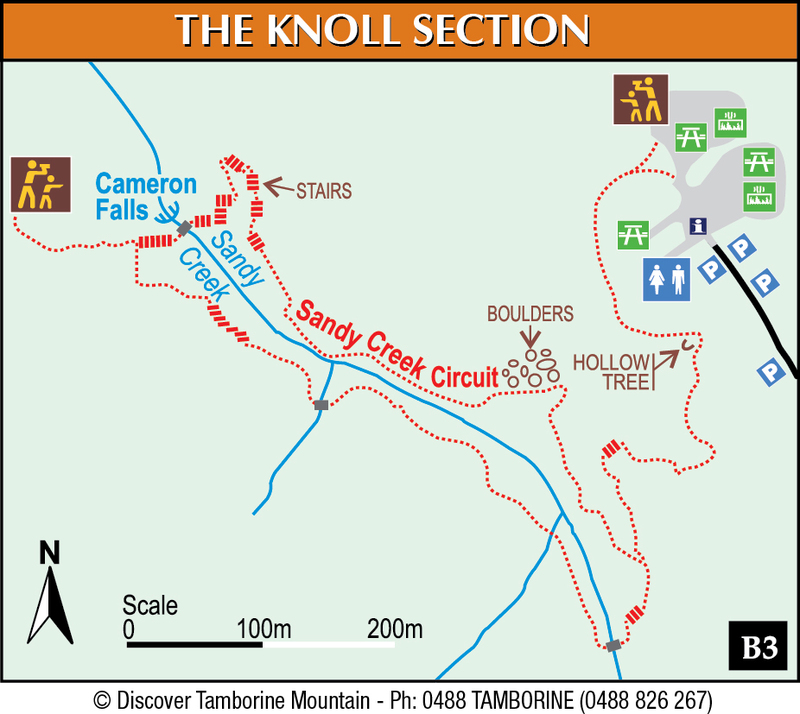 The track descends from the car park to the creek through transitional rainforest with large flooded gums and Piccabeen groves. Often large black skink lizards can be seen sunning themselves on this track (42 stairs). Turn right when reaching the Sandy Creek circuit “T” junction, and follow the gently sloping track, watch for water runoff channels diagonally crossing the track. When the track curves to the left, look out to your right for an impressive boulder field, the view is partly obscured by a palm grove (14 stairs). The creek now becomes visible below on your left. The track follows the creek and keeps descending towards the escarpment. Gradually, the forest opens up, and the rambling of “Cameron Falls” waterfall can be heard in the distance. The track turns sharply left, continuing along the cliff edge. You will soon reach a concrete bridge crossing Sandy Creek. The creek drops away over the escarpment, creating “Cameron Falls” (85 stairs). 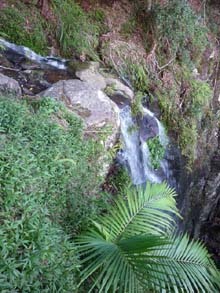 The creek upstream as well as the clearing it created towards the falls are one of the many rewards for walkers coming to Tamborine Mountain. A branch track to Cameron Falls Lookout (75meters) just past the bridge enables you to truly appreciate the natural beauty of this waterfall. 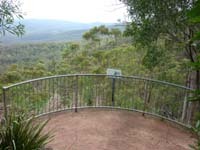 The lookout is very safe, offering spectacular views to Mount Flinders and Brisbane in the distance, as well as Cameron Falls to the right. Walkers often spend a lot of time here, taking in the serenity of the area (29 stairs). Continue right when returning from the branch track. 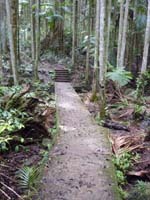 You will cross a timber sleeper bridge crossing a small creek, before reaching the upper “Sandy Creek” crossing (69 stairs). A concrete bridge crosses Sandy Creek, offering good views both upstream and downstream. 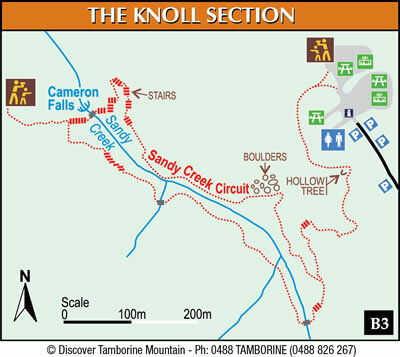 A short stroll leads back up to the Sandy Creek circuit “T” junction, turn right and follow the uphill track back to the car parking area (70 stairs). This entry was posted in Tamborine National Park and tagged Cameron Falls, rainforest, Tamborine, Tamborine Mountain, Tamborine national park, waterfall on January 1, 2013 by Detlef. For ease of parking, turn off Eagle Heights Road into Dapsang Drive at the “St George Anglican Church”, there is a very large parking area to the left at the end of the street. This parking area serves the church as well as the walking trail. 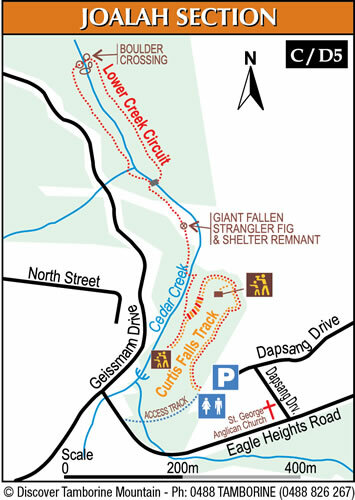 Alternatively, you can also access the start of this walk via a 400meter long walk starting via a small timber bridge at the “Curtis Corner” T- junction of Eagle Heights Road and Geissmann Drive. This is a popular tourist stop with several cafes and eateries, so parking is limited at times. Curtis Falls (D5) 1.5km return, 101 steps, moderate grade with some steeper sections, allow 60 minutes return with plenty of time to admire the waterfall. The start of the track meanders downhill through wet eucalypt forest beneath towering flooded gums. Take advantage of the viewing platform on the left, allowing rainforest views towards the creek below. A plaque gives information about the illusive “Albert’s Lyrebird”. Joalah is an Aboriginal word meaning “Haunt of the Lyrebird”. During the winter months, the loud calls of the male Albert’s Lyrebird can still be heard (12 stairs). After the viewing platform the track gradually descends to Curtis Creek, which is reached after the last set of steps. You will notice a drop in temperature as you descend into lush rainforest. Look out for beautiful crows nests and staghorn ferns growing in the canopy above (106 stairs). Turn left to reach beautiful Curtis Falls, only a short stroll away. The falls run all year-round, however, they are at their most spectacular after heavy rainfalls. 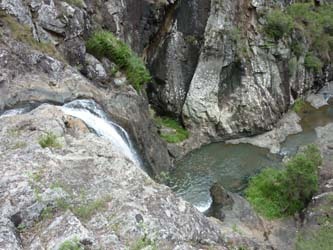 The track ends at a viewing platform overlooking a large rock pool, with great views of the falls and the surrounding columnar basalt rock face (6 stairs). This entry was posted in Tamborine National Park and tagged Curtis Falls, rainforest, rock pool, rock pools, Tamborine Mountain, Tamborine national park, warerfalls, waterfall on January 1, 2013 by Detlef.